Set against all of the fantastic species I saw on my holiday to Cyprus in December 2014, such as Finsch's wheatear, spur-winged plover, wallcreeper and greater sandplover, you might think that a chiffchaff would be amongst the least interesting. You'd be wrong. On 14th December I innocently recorded the call of one of the many individuals I came across, uploaded it to xeno-canto as race brevirostris and put a link to it on my blog, little realising that it was about to be analysed by some of the leading chiffchaff experts in the land, and potentially help change our understanding of the wintering ranges of chiffchaff. Based on these discussions, emails and personal research, I've put together a summary below of the situation as I see it regarding wintering chiffchaffs in Cyprus. Thanks to John Harris for his help. Disclaimer: The following notes are entirely my opinion based on extremely limited non-scientific observations and do not necessarily represent the opinions of any other individual. Virtually from the moment I arrived in Cyprus I couldn't fail to be aware of chiffchaffs. At first they were annoying little blighters because I couldn't work out what it was that was calling. They were a frequent, nagging soundtrack to all of the other fantastic birds I was seeing as if they were saying "forget that spur-winged plover, look at me"! The problem was, they weren't calling "huweet" like the British chiffchaff Phylloscopus collybita collybita, they were calling "peep", in fact a call very similar to that of Siberian chiffchaff P. c. tristis, and there were lots of them about. I probably heard upwards of 10 a day, all over the place in a variety of habitats. Following a little research on the Internet I came to the conclusion that in both plumage and call, these chiffchaffs most closely matched birds from the region of N and W Turkey, which have been designated as brevirostris by some authors but are merged with abietinus by others. However at this stage I still had no knowledge of the status of brevirostris on Cyprus. Fortunately I recorded one of the calls and uploaded it to xeno-canto (you can hear it below). After an initial contact by John Harris, I got involved in email conversations with several people, including internationally recognised chiffchaff experts and senior BirdLife Cyprus representatives regarding the possible race of these birds. It turned out that brevirostris has never been officially recorded on Cyprus. 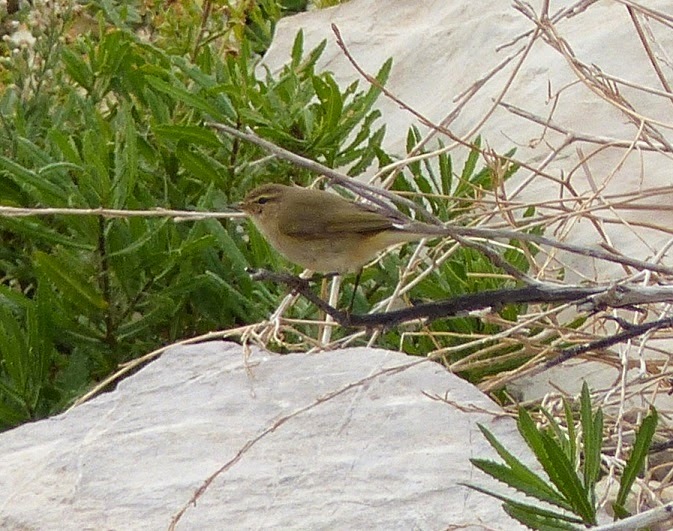 The long held assumption was that over wintering chiffchaffs on Cyprus fall into two races, P. c. collybita and P. c. abietinus. However, both of these races call "huweet", a call which I just didn't hear in the 13 days I was on the island. Everything went "peep". My recording was analysed, and based on that analysis it emerged that the Cyprus birds do indeed have a call matching brevirostris. Far from being unknown on Cyprus my experience from admittedly limited observations indicate that brevirostris (whether as a separate race or just a form of abietinus) is by far the commonest chiffchaff in winter, certainly in the areas of western Cyprus which I visited.